Isn’t about time the Saints fans give it a break? Everyone knows y’all got screwed, that seasons over. ​Henry Jaume, a native of New Orleans and diehard Saints fan, passed away hours before the Super Bowl this past Sunday. And, in the wake of the non-call that prevented the Saints from making the trip to Atlanta, that provided plenty of fodder for the deceased to strike back from beyond the grave. 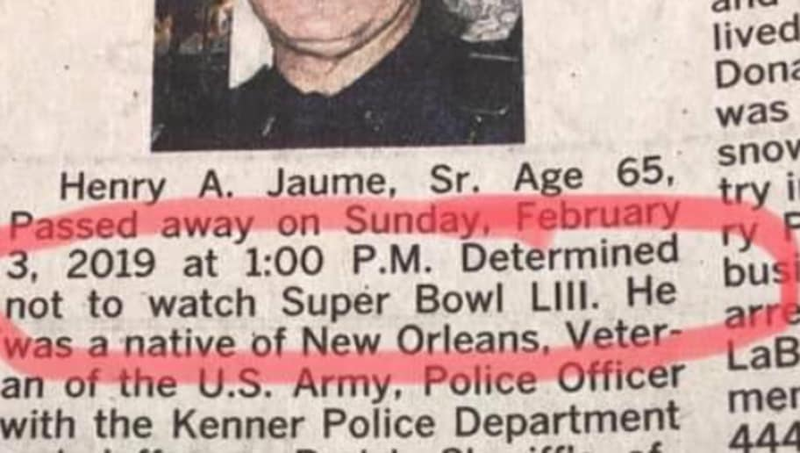 ​​In his obituary, his family decided to add a light-hearted joke, saying he passed early Sunday because he was “determined not to watch” this year’s Super Bowl. Jaume, along with virtually every Saints fan in the world, was not happy with the fact that the Saints got blatantly robbed at the end of the NFC Championship game, and his family is certainly not letting that go. Many other fans took action following the no call. In fact, one Saints fan bought several billboards all over Atlanta and plastered the message “NFL BLEAUX IT,” among other takedowns, throughout the city. There are billboards on I-85 in Atlanta that read “NFL BLEAUX IT!”. Overall, ultimately it is very unfortunate that Jaume has passed with such timing, but his family found a funny way of honoring his love for the Saints, and the entire city’s remaining distaste after the historic non-call.